TL News Night - Monday, September 22, 2014 started the 2nd season of TL News Night with special guests from the Association of Indiana School Library Educators (AISLE). The "hot topic" was The Power of Networking. ISTE Librarians Network - Wednesday, September 24, 2014 kicked off the new season of professional development webinars via the ISTE Librarians Network. If you missed this webinar you can watch it HERE. Students and teachers from grades 3 - 12 focused on learning Google Classroom and Khan Academy. Both of these technologies allow for continuous formative assessment and relationship building when used properly. Linda Schmidt's students kicked off the week by completing a mathematics writing assignment that Ms. Schmidt had prepared and uploaded into the Google Classroom class she set up for students in advance. Once students had completed the writing assignment they moved on to learning how to access and move through Khan Academy with their Ms. Schmidt as their coach. Ms. Gaston's 6th graders were next up to learn about the magic of Google Classroom. Ms. Gaston had prepared a writing assignment where students had to tell the steps for completing long division. Ms. Gaston's class also explore how students can use the comment feature to ask questions or engage in a two way conversation with Ms. Gaston. Next, Ms. Gaston's students were introduced to Khan Academy and began working on their individual learning paths within Khan. The Dynamic 4th Grade Trio of Ms. Adams, Ms. Bates, and Mr. Hobbs steadfastly tackled using Google Classroom with their students this week to write a persuasive paragraph about what kind of business best would benefit the community. Students had to provide at least three reasons why the business they chose would benefit their community. 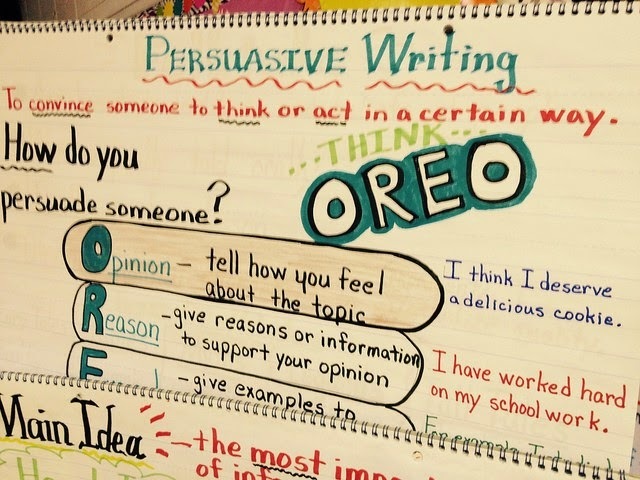 Using the OREO graphic organizer, students were able to organize their writing. This Daring Trio also dove into Khan Academy with their students! The 4th grade students enjoyed the freedom to move at their own pace and teach themselves rather than remain passive in the learning process. All agreed it was nice to have to power to pause and rewind when needed. Too bad our Dynamic Trio doesn't have a pause and rewind buttons! Next week Mr. Hobbs, 4th grade teacher, will have a new student as part of his classroom family. Moving from one school to another school is often a hard transition for students to make. They are leaving old friends behind and going to a new place where they don't know anyone. Fears of will I fit in, will I make friends, what is my teacher like, what is our schedule, etc plague students before a school change. 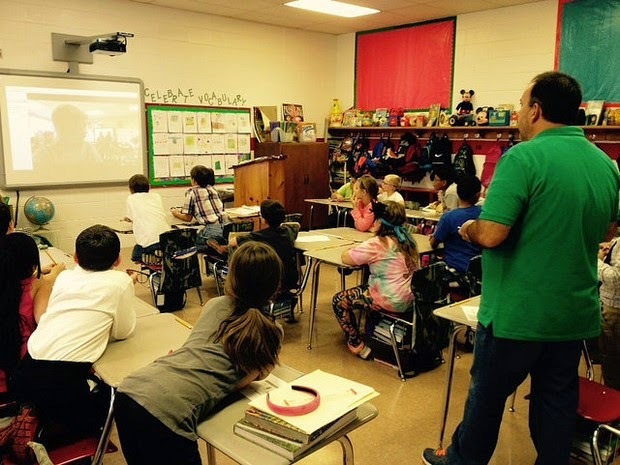 To help ease the nerves of this student and to help him feel a part of the class before even coming to Mr. Hobbs' class, we Skyped with his current classroom. Teachers and students from both classrooms were able to see each other and talk to each other. Participants in both classrooms asked questions and by the end of our Skype session Mr. Hobbs' students were sad to say goodbye and can't wait for the new member of their class to arrive! New tutorials were created this week for teachers wanting to move forward using Google Drive, Google Classroom and Khan Academy on their own and at their own pace. You can find all of the tutorials HERE. If there are any technology tutorials you would like for Ms. Robertson to create please email her HERE.